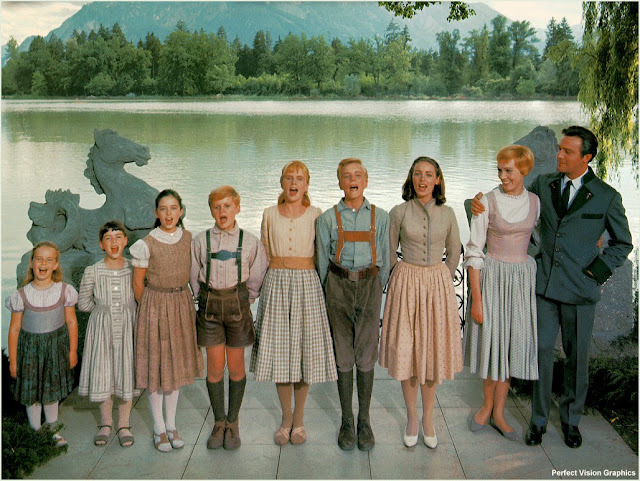 It was brought to my attention today that our family is nearly the size of the Von Trapp family from The Sound of Music, my all-time favorite musical! In the next two and a half months, Lord willing, we'll be welcoming a new daughter making seven children. And sorry, but we are not naming her Gretl. As I was looking through some stills from the movie and thinking about us versus the Von Trapp family as portrayed in the film, I started laughing to myself when I thought about how we are really NOT like the Von Trapps at all. But there are some similarities too. 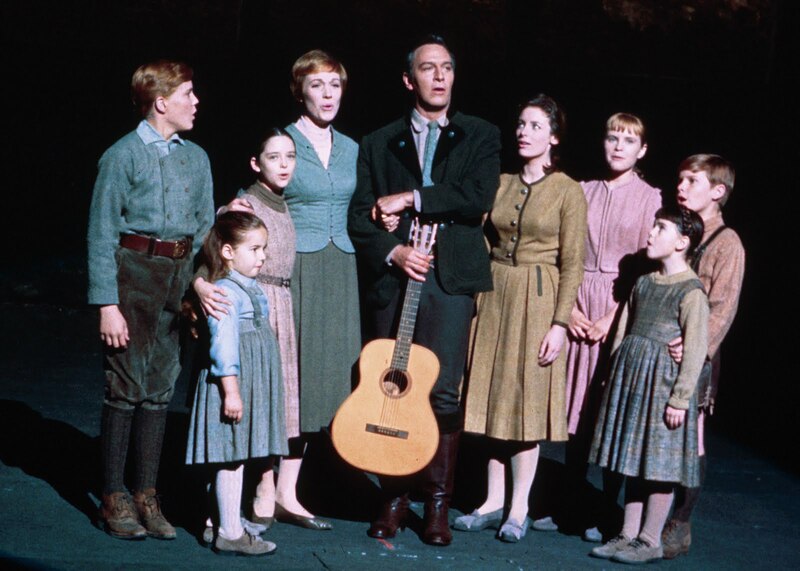 Here's my list of 9 similarities and differences between us and the infamous Von Trapps. There are 9 only because I couldn't come up with a 10th, after sitting here for way too long. Our boys do not wear knee highs and lederhosen. ha! We do not use a whistle to call our children, but I must admit there is one similarity here. We do stomp at the top of the stairs three times when we need the kids to come upstairs from playing in their rooms in the basement. It's our version of an intercom system or Georg Von Trapp's whistle. And the goal is to be at the top of the stairs to see what is needed in less then ten seconds. Who needs to yell or whistle for them, when you can stomp? We are clearly not a singing group, though we all love music and can sing (we try) and boogie down together like nothing else. And we are known to spontaneously break out into show tunes around the house. We do not have an enormous puppet theater, but what fun that would be! That was my favorite scene of the movie as a child. "Lay ee odl lay ee odl-oo"
Jeremy has Georg beat in the stellar Dad department in my opinion, and I'm pretty sure he can sing a mean Edelweiss too. Minus the guitar, he'd need some lessons first. Edelweiss was one of the first songs I learned to play on the harmonica as a teen, and can still play it today. Sort of wish I still had my harmonica, but plastic kid's ones work pretty well too! I have never cut and sewn play clothes out of old draperies before. But I wouldn't put it past myself. I remember as a child thinking that was the coolest thing ever! Though I never understood why they needed to order new drapes in the first place. I loved them. Sadly, my children have said their fair share of embarrassing things to friends of ours, much like Brigitta telling Maria, "I think your dress is the ugliest one I ever saw!" Kids keep us oh-so-humble, don't they? We do sit down to a family dinner every night like the Von Trapps. Tonight it was a free-for-all since we ate a huge Sunday afternoon lunch, plus neither Jeremy or I felt like cooking. Our family ate a combination of grapes, cheddar cheese, bagels and cream cheese, cereal, apples, and coconut M&M's. That last delicacy was only eaten by me. In secret. In the corner of my kitchen when no one was looking. And this little clip is just for fun! 3 comments on "almost the VonTrapps"
What a FUN post!! I love it! We have 8 but are no where NEAR the von Trapp family!! 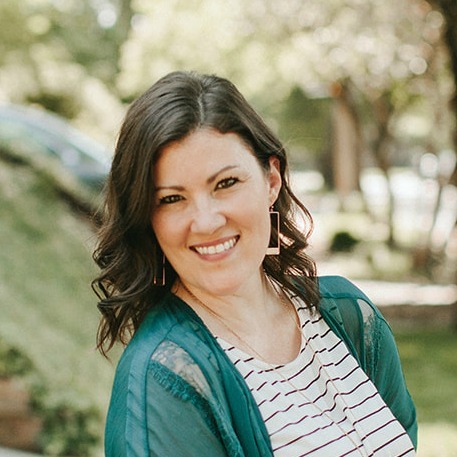 I would love to see you link this up on my Tuesday link-up Loving Our Children. As always, I loved your post. Yes, to echo the above comment, your family is beautiful. HAHAHA about eating the coconut M & M's in the corner of your kitchen in secret when NO ONE was looking. Mom and Dad did a similar thing when us kids were growing up. My Dad had gotten a box of See's Candy for Christmas from his place of work, either by his Employer or from one of his fellow co-workers, or a customer. He brought it hoome and mentioned it to Mom. Well, they didn't want us kids to know about it, so they stuck it up on top of our hughjer. I don't know how long it took them to eat it, but they ate the entire box, just the two of them. I'm wondering now if Dad only showed Mom the See's Candy box after us kids were all safely tucked in bed. None of us kids had any idea about it until years later. I think they ate the candies after we were in bed, or when we weren't looking. Love the method of stomping three times at the top of the stairs. Works just as good as whistling does, I'd say. My family loves music too, well most of them, some of the kids don't like to sing much, but I'm/we are working on them.